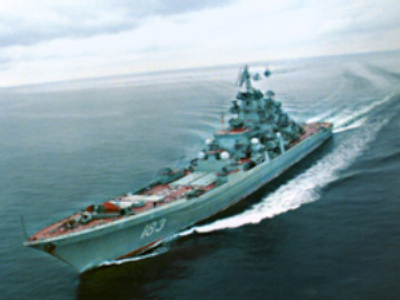 The Russian Navy has confirmed that a fleet of warships belonging to the Russian Northern Fleet is preparing to cross the Atlantic Ocean and head for the Caribbean. The squadron, led by the Northern Fleet’s flagship Pyotr Veliky (named after Peter I of Russia or Peter the Great) – one of the world’s largest heavily-armed nuclear-powered guided missile cruisers – will participate with the Venezuelan fleet in the Caribbean naval exercise in November. This will be Russia’s first manoeuvre in the U.S. backyard in nearly 20 years. Russia and Venezuela agreed in July 2008 to conduct this exercise when Venezuelan President Hugo Chavez visited Moscow. Due to the fact that the agreement was made a month before the U.S. ordered its warships to enter the Black Sea, Moscow and Caracas deny any connection between the presence of the U.S. command ship near Russian borders and the Russian fleet heading to America’s doorstep. The naval exercise will be conducted in Venezuelan waters between the 10th and 14th of November. The Russian and Venezuelan Navy will together perform dry runs of relief operations and test their tactical communication systems. In total, 1000 personnel on four Russian warships will be involved in the naval exercise in Venezuelan territory this autumn. In addition, Hugo Chavez has approved Russian nuclear-capable strategic bombers to use Venezuelan military airfields. These actions could be seen as Russia hinting to the U.S. that, despite surrounding Russia with U.S. military bases, America is just as vulnerable to attack as any other country. The fact that the Russian cruiser was not designed as an instrument of attack, but instead for nuclear containment and defending nuclear submarines, this exercise looks more like an invitation to a dialogue with America rather than a military threat. Moreover, the fact that the American presidential campaign has entered its final stage, it is expected that both candidates Barack Obama and John McCain are going to exploit this naval exercise to their own benefit, verbalizing on the “return of the Russian threat”. This rhetoric may become the decisive factor for one of them to make the White House his home for the next four years.